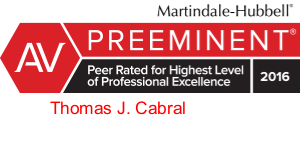 A Partner and the General Litigation Practice Group Manager, Tom Cabral defends public and private companies, insurance carriers and individuals in general liability claims involving property damage, personal injury, employer intentional tort, and wrongful death. He has litigated a wide variety of cases in the areas of premises liability, liquor liability, pharmacy liability, motor vehicle and motor sports liability, criminal assault, and industrial workplace accidents, particularly in the retail, housing, restaurant, and entertainment industries. He also defends insurance carriers in coverage matters, and against claims alleging bad faith and unfair claims practices.